LOS ANGELES • Retiring Los Angeles guard and future Hall of Famer Kobe Bryant may have won the battle on Saturday in his final trip to San Antonio. But it was the Spurs who won the war, thanks to a combined 46 points from their two starting forwards and a pair of huge baskets by point guard Tony Parker down the stretch. 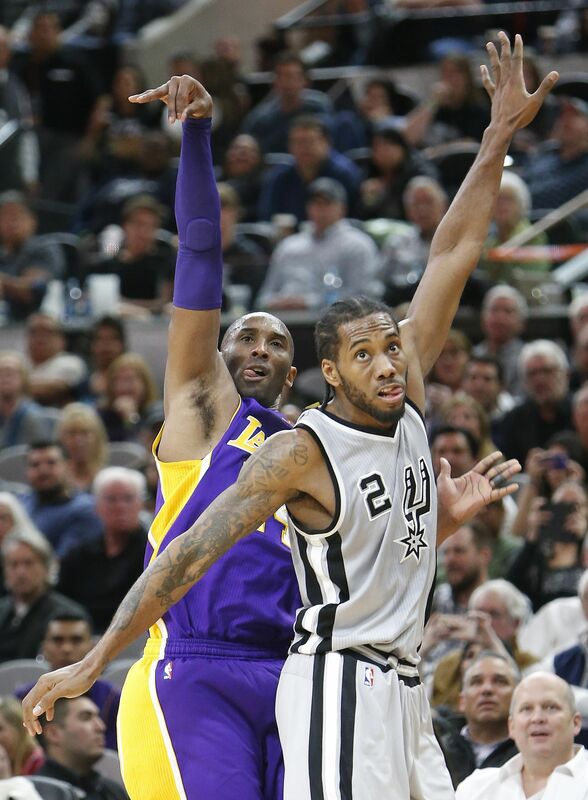 The Spurs survived a riveting command performance in Alamo City by Bryant and outlasted the Los Angeles Lakers 106-102 to win their fourth straight National Basketball Association game and remain unbeaten at home. Bryant, who is retiring at the end of this campaign after spending 20 seasons in the NBA, all with the Lakers, finished with 25 points, 16 of them in the third period to help lead the Lakers back into the game. "You've got to execute and we didn't for a lot of the game and Los Angeles were fired up," said San Antonio coach Gregg Popovich. "It was a great night for Kobe, which is thrilling because I think he's great. It's like watching Michael (Jordan). "We made some mistakes and he took advantage of them. He's fantastic." San Antonio got a game-high 26 points from forward LaMarcus Aldridge, and 20 points and 13 rebounds from forward Kawhi Leonard, who also grabbed a huge offensive rebound after a missed free throw in the final minute. The Spurs turned up the heat on both ends of the floor in the last four minutes when it counted the most. San Antonio (43-8) improved to 28-0 at the AT&T Centre this season, extending their record for the best home start ever by a Western Conference team. The victory also allowed the Spurs to lengthen their regular-season, home-victory streak to 37 games, dating back to an overtime loss to the Cleveland Cavaliers last March, and matched the best overall start in franchise history after 51 games (set in 2010-11). Saturday's win was the Spurs' final home game before their annual Rodeo Road Trip, precipitated each year when the San Antonio Rodeo takes over the AT&T Centre for a three-week period. This year's trip covers eight games and is extended by the week-long break for the NBA All-Star game. Spurs will not play at home again until they host Detroit on March 2. Los Angeles lost centre Roy Hibbert to a left ankle sprain eight minutes into the first quarter. He turned his ankle when he tried to respond to an up-and-under fake on a shot by Parker and went down. San Antonio also got 14 points from Parker, 13 points from reserve guard Patty Mills and 11 points from guard Danny Green. Guard Jordan Clarkson added 21 points, while forward Julius Randle had 15 points and 17 rebounds for the Lakers (11-42), who had their two-game win streak snapped. Bryant hit his first shot of the game but had only four points on 2-of-10 shooting after 15 minutes of action in the first half while matched up against Leonard, the NBA's reigning Defensive Player of the Year. He found his stride and a measure of youth and energy in the third quarter when he took over the game. The Spurs saluted Bryant (who is now 43-47 in his career against San Antonio) with a montage of clips before the game and that made it hard for him to get into a competitive mindset early on. "That tribute brought back a lot of great memories - I'm so thankful to the Spurs for doing that for me," he admitted. "It's strange that I won't be coming back here. I might come down sometime again, just to mess with Pop (Popovich)."